March was Seagrass Awareness Month in Florida. The designation began in 2001, in an effort to explain to the public why seagrass was important and should be protected. Seagrass is not visible to most people and the role they play in the ecosystem is not understood. Seagrasses are grass like flowering plants found submerged in coastal marine waters. They evolved from land plants millions of years ago. Many people mistake seaweed for seagrass but their ecology, morphology and physiology are different. There are 72 different seagrass species around the world. Seven species are found off the coast of Florida. Seagrasses are important as they provide food and habitat to numerous marine species. They help maintain water clarity by trapping fine sediment and particles with their leaves. They also stabilize the ocean bottom with their roots and help support local economies. Seagrasses are capable of capturing and storing a large amount of carbon from the atmosphere. They take carbon from the water to build their leaves and roots. As parts of the seagrass plants die and decay, they can collect on the seafloor and become buried, trapped in the sediment. It has been estimated that in this way the world’s seagrass meadows can capture 27.4 million tons of carbon each year. Threats to seagrass include storm activity and other climate changes. The wave energy from a storm can uproot seagrasses and cause extensive damage. Floods and droughts can change the salinity of the water which can affect their distribution. Grazing by some marine animals like the manatee is another natural factor. Humans also pose a threat through dredging and boating. 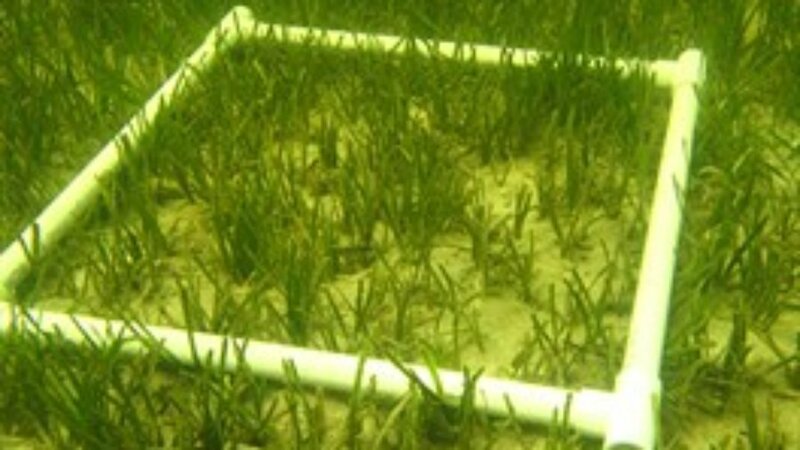 Boat anchors and propellers can leave scars in a seagrass bed, killing sections of the seagrass and fragmenting the habitat. Run-off is a major problem because it can change water quality and reduce the light reaching these plants. Nutrients from fertilizers and pollution wash off the land and into the water, causing algal blooms that block sunlight necessary for seagrass growth. The FWC’s Fish and Wildlife Research Institute developed the Seagrass Integrated Mapping and Monitoring Program (SIMM) in 2009, to protect and manage seagrasses in Florida by providing a collaborative resource for seagrass mapping, monitoring, and data sharing. They released their report in February on seagrass health and status. The researchers provide a concise overall assessment and color coded report cards of seagrass status as well as a map of the distribution of seagrass beds. Researchers estimated there are approximately 2.5 million acres of seagrass in estuaries and nearshore waters of Florida. These are the largest beds of seagrasses found in the continental United States. This statewide reporting network has found that seagrass beds are stable and healthy in many areas, but they are vulnerable to water pollution and other stresses. There is good news for example, Tampa Bay and Sarasota Bay now have more acres of seagrass than were present in 1950. In many other areas of the State, seagrass beds are generally stable or slightly increasing in area. However, recent losses of seagrass in Florida’s Big Bend, Florida Bay, and the Indian River Lagoon have occurred as the result of extreme weather, heat, water pollution, and algal blooms.